PADI Pros – How is My Trim? We all love doing our bit for the environment and to help preserve our reefs and corals, you can’t help but notice Project Aware pushing for us to stop using plastics and pollutants that ends up in the oceans. Sometimes we ourselves are directly the cause of damage to the reef and that’s always down to the lack of knowledge about buoyancy control and trim. This is something that we as PADI Pros have the responsibility of correcting and it couldn’t be simpler. We have all been on that dive when we see another dive group pass and the divers are sea horsing along at the back of the group, but what is causing this? Why is the diver not correcting it? Its all down to a couple of super simple things and it starts with correct weighting. When was the last time you jumped in the water and took the time to do a quick weight check… it might have been some time since your open water course. Many times I have been the Divemaster on the boat guiding experienced divers on a discover local diving tour and they have got so used to the feeling of been over weighted it becomes the norm, the problem with this is that when these divers then dive with the correct weighting they feel as if they are “floating up” or if they are diving in a dry suit it does feel like your feet are quite high at first. So how do we solve these problems? Firstly, start by grabbing a fellow diver it doesn’t have to be a Divemaster or Instructor and start with the basics of a simple weight check, which is with an empty BCD you should be able to float around eye level while holding a normal breath then exhale and sink, but remember not to kick your feet and relax as you breath out. If you drop under nice and slowly too a few meters then slowly inhale you should rise slowly again to the surface, you should be able to keep yourself on the surface without kicking your fins and by holding a normal breath, think of 80% lung volume as a normal breath. 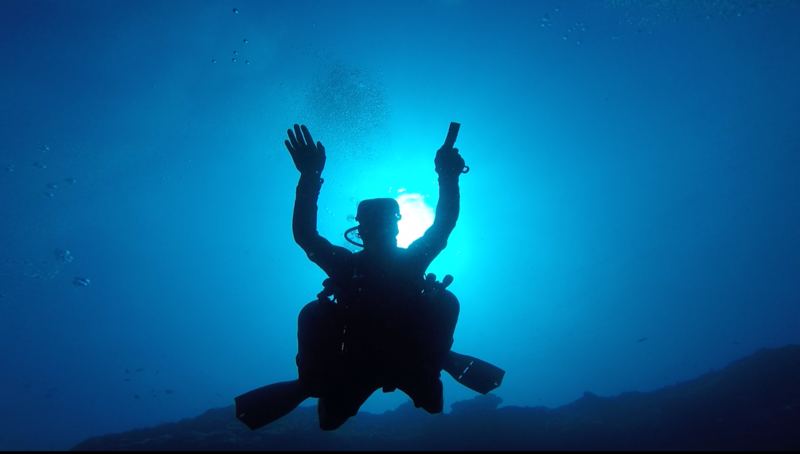 If you are having to force all the air out of your lungs to sink then the start of the dive will be ok, but on safety stop you may find yourself have to shallow breath to hold your safety stop, which is no fun and can cause a nasty headache, so don’t go crazy trying to shed those weights, find a nice balance. Ok now you have got yourself weighted properly it’s a great idea to hover in what you feel is trim and have a friend take a photo, you might be surprised your feet may be quite low, now its time to get a bit friendly with your buddy, ask them to raise your legs and fins to actually put you into a nice flat position so you can get the feeling of trimming out like the best of them..remember to arch your back and point your toes away from yourself, hold that position and then have a swim round and get back into position. Get used to the feeling of your feet been a bit higher up than when you are over weighted, spend time breaking trim and regaining position, and maybe even spend some time on the same dive working on finning techniques, work together and give each other feedback and take loads of photos of each other. Spend a dive doing this and also since you will probably burn plenty of air playing around, no sweat we want that as well, get your cylinder down to 50BAR/500PSI try and hold an in trim safety stop, when on the surface complete another weight check, you shouldn’t need to make much of a change (maybe 1LB either way) if your first weight check was done properly. Why bother I don’t need to look like a Padi Tec diver?! I love to look nice and flat in the water, and agreed it looks pretty cool but its not the point! When we have good trim everything gets easier and more efficient, starting with our fin kicks, as our legs are in a better position we find it easier to complete kicking techniques such as the frog kick, as we are flat in the water every kick sends us in the right direction so it requires less effort to cover the same distance as an over weighted diver… so less energy… that means less wasted air and you will notice your air consumption improves… and if that’s not enough… as we are always in a nice flat position navigation becomes easier as we always have eyes on the direction you are traveling. Personally I feel like my divers enjoy themselves more and see more when they have correct weighting and trim. BUT above all it keeps divers fins off the reef and stops avoidable damage being caused to our reef!! Get out there and enjoy Trimming out!!! !